I had the opportunity recently to sit down with Jaime Davidovich, Analia Segal, and Patricia Villalobos Echeverría – three artists from Latin America of two different generations. Jaime Davidovich, one of a handful of New York artists who experimented in video in the 1970s, had earlier abandoned painting for the more tenuous act of spatial intervention and institutional critique but, in doing so, created works of intense sensual beauty. Analia Segal, like Davidovich, was born and raised in Argentina and came to the US to shape her career as a professional artist. She refers to her work as “unruly abstraction” – emanating from and speaking of instability while offering enigmatic humor as indicative of resilience. Patricia Villalobos was born in the US of Salvadoran parents but was raised in Nicaragua where she feels her strongest roots. Her work is a complex maneuvering between realist narrative and abstract metaphor to reveal connections between identity, politics, and place. We discussed the significance of surface to their work, its relation to abstraction, and how its complexity contradicts any presupposed notion of flatness. Kathleen MacQueen I’m wondering if you’re understanding these surfaces as painting and sculpture and therefore visual, or architectural and therefore spatial, or even as textile and therefore tactile? Jaime Davidovich First of all, I started doing this type of intervention many years ago and one of the things that made me change the surfaces was my conflicted relationship with the “white cube” exhibition space. I started these surfaces at a time when the white cube was considered the ideal situation for showing art. I also had a problem with the salon style of hanging pictures like little soldiers. So the problem was how to transform the white cube into something else. I was very interested in “using” the cube instead of putting things in it and the tape projects became my first interactions. KMQ Would this be 1970? JD I’m talking 1967 for the first tape project and 1970 for the first exhibition of interventions. KMQ Was the term “intervention” used then? Was it part of the art vocabulary? JD This was the avant-garde of the avant-garde. Now when you say “intervention,” even a first year art school student knows what you’re talking about but then not even the avant-garde would be familiar with the idea. It was outside ideas. KMQ Were you still in Argentina? JD No, I was here in New York and I was doing monochromatic paintings and wanted to get rid of the stretcher so I used tape to hold the paintings and from there came the idea of just using the tape to cover the surface. Since I have this love/hate relationship with the cube, I wanted to do work in spaces that were wasted, places where you’re not supposed to show art. I was invited for a group show and instead of doing a piece within the confines of the gallery I wanted to do something in the staircase. This conflict with the white cube took me places that were not considered suitable to show art. This is considered “wasted space.” I was interested in going into the street whether the sidewalk or the road and also windows – any space that was not associated with what I saw as the limited space of the cube. JD I would go into a pristine space and cover it with scotch tape. This makes you immediately aware of the space in a new way, which in turn becomes an element of the work. Analia Segal A couple of things come to mind listening to Jaime…first of all, I was born in 1967 in Argentina and I started using tape only a couple of years ago and never thought of it in terms of Jaime’s work before… I’m using electrical tape to connect and deal with the architectural space where I create installations by connecting 3-dimensional objects to the walls, which also focuses attention to the wall and provided the possibility of adding successive layers, like wallpaper. Analia Segal, Implosion, installation detail, Opus Projects Gallery, 2015. Courtesy the artist and Opus Projects, New York. KMQ You’re using electrical tape functionally but also to delineate the surface, is that right? KMQ What about this idea of “covering” – is the tape hiding something or exposing? JD You are covering yourself. You can call it “protecting” yourself or “repressing” yourself. This becomes a dual aspect of covering and revealing the space. Also, there is the notion of silencing: if you don’t want someone to speak, you cover their mouth with duct tape. Patricia Villalobos Echeverría I was thinking about the term “intervention” and how that term was used during the war in Nicaragua. I often think about that word in relation to its political or military application as well as its newer meaning as an artistic interruption. I imagine in the earliest years of artistic intervention the connection to its military use was apparent. Then there’s the relation to capitalism, that “intervention” cannot be coopted by capital in the same way as traditional painting or sculpture. There’s also the relation to soft sculpture as a feminist gesture and in this way I see similarities with Analia’s work but, for me, work on the surface started with video. KMQ There’s your affinity with Jaime’s work! PVE I was doing projections on the walls and the surface became both a receptor and carrier of the video projection matrix. I would make sculptural forms that were suspended from the ceiling and the sculptures would interrupt the video projection on the wall. The walls became important as part of a larger visual narrative with the video projections. 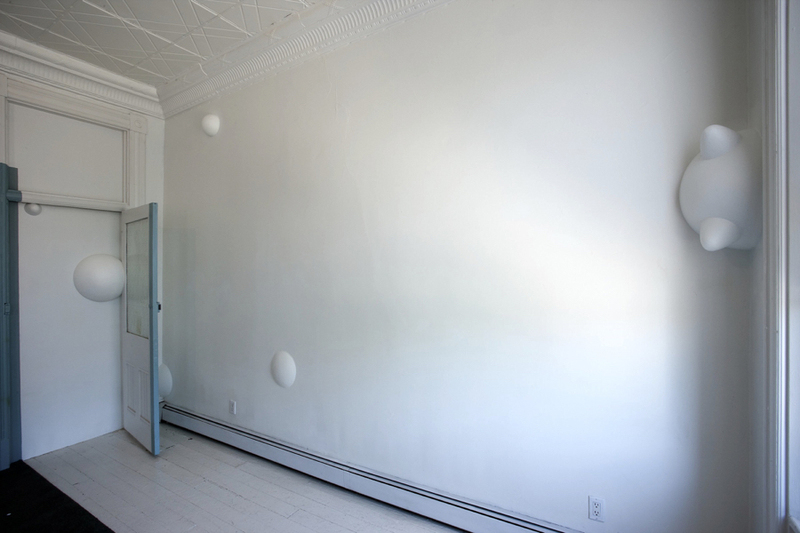 Later I let go of the video in relation to the protrusions on the wall and let them stand alone as sculpture. 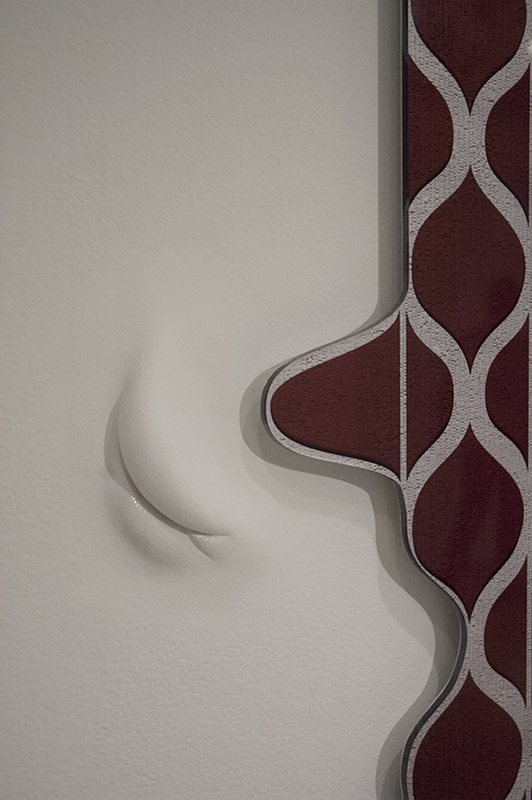 The sculptures become diminutive, there are 100s of them on the wall and now the wall becomes skin. So the move to and across the wall was gradual. Patricia Villalobos Echeverría, memeplex @ N14°06’17” W87°11’59”, installation view, Centro de Artes Visuales Contemporáneo CAVC/MUA, Tegucigalpa, Honduras, 2013. Courtesy of the artist. KMQ There are different dynamics in relation to the surface: painting, sculpture, film/video, projection, tactility of skin… What about the idea of membrane? PVE Yes, I often think of the elements that I select for the gallery space as evincing transformation or movement…something that’s in constant change. Later the shapes become doubled, less in the sense of mirroring as cornering – that is, creating interstitial spaces that have tension. KMQ The repetition feels very cellular and you’ve addressed the idea of contagion in the past. Is the surface of the wall a living substance in that sense, pock-marked by memory, or replicating itself like a cell? PVE Yes, they know…they’re facile with that kind of language. Since the piece was on the exterior wall surface of the Centro Wilfredo Lam as well as in the entrance, it was visible to a wider viewing public than just the biennial viewer. The Cuban public got its subtextual meaning – for them it was a critique of institutional power – they saw that the building was ill.
Patricia Villalobos Echeverría, cystema @ 23°8’27.054″N 82°21’10.117″W, installation view at Centro de Arte Wilfredo Lam at the XI Havana Biennial, Havana, Cuba, 2012. Courtesy of the artist. AS Jaime’s idea of spaces outside the white cube and your idea of the interstitial space, is close to my notion of displacement. The kinds of spaces I define with tape can reflect either shelter or a hostile space. PVE I think of your pieces as very psychological. Even the video breathes, while the architecture is animated by those who inhabit it. KMQ If these walls are in that sense living and breathing entities, are they also projections of our fears and desires? PVE I don’t necessarily see this as negative – contagion, contamination, reproduction, mimesis – these can be agents of change. I use doubling and reproduction as a disruption to an oppressive normalcy in the way that queer aesthetics could be. That’s its theoretical origin. JD When you talk about displacement, you can also discuss isolation and to be an outsider. I begin with an idea and do the work. Afterwards, I reflect on the reasons and motivations. For example, I felt keenly my status as an immigrant artist in the US. At the same time, I didn’t feel up to the same standards as the New York avant-garde. Being an outsider is a likely motivation to work outside the mainstream norm. There were very few who were members of the accepted avant-garde and there were even fewer of us doing radical work in no man’s land. Even in comparison to the accepted Latin American art of the time, which was formalist Modernist art, we were different. Whether here or in Latin America, if you were not Tamayo, Siqueiros, or Rivera, you’d have a hard time. This way of working outside the system was very attractive to me: it was ephemeral, it questioned the system, it countered the norm in how you display art and the role of the artist. This is both political and foreign. AS Jaime, when I talk about my work, I often use the image of the hornero, the national bird of Argentina, in particular an image where the bird has nested on a statue, safely between the arms of the Virgin Mary! The result of this little bird’s foraging is an incredible piece of architecture and beautiful object and I find similarities between the creative process and the notion of foraging, which implies adaptive wandering and gathering as a methodology. 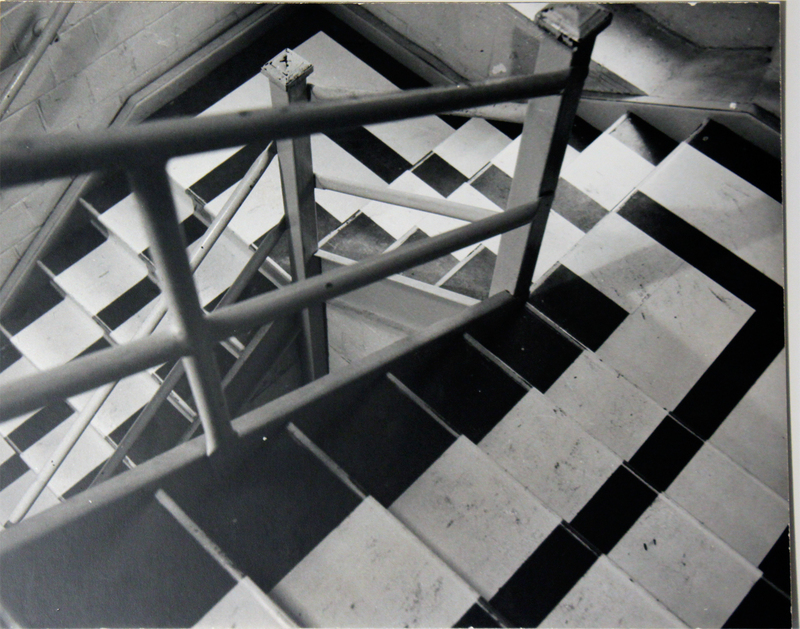 Jaime Davidovich, Staircase, 1971. Courtesy of the artist. JD: …to feel comfortable that I was not in competition with the American artists. It’s also interesting that you say “video” or “video projection” because you don’t say “videotape.” Videotape doesn’t exist anymore. It’s archaic. But for me videotape was similar to packing tape. The reel, going on and on, the sense of time…I got involved in video because of the tape [laughter]. The first video I did was of a line of tape. I was recording tape with tape. So in approaching the gallery you would see the line of tape leading to the space, inside you would see the video, and then you would see the tape changing the space of the walls. AS And when I began doing video animation, the surface was the wall and the tension between the 3D and 2D animation. Both the scale and the surface of the video projection interested me. KMQ Along with this playfulness, is there an element of disguise in both Jaime’s and Patricia’s work? Certainly in Analia’s work there’s an ornamental aspect – both disavowal and acceptance of ornamentation. And, Jaime, what about effacement – that one might obscure information by putting a new surface on top of an old surface, almost like a mask? AS With an interior there’s a feeling of malleability and adaptability but with an exterior it’s all about structure. That’s why I feel that we’re all talking about negotiation – the surface is a space for revealing and concealing but it also implies what can happen on the other side. I associate that idea with coming from Latin America where every day life is so unstable. How do you negotiate that to survive? There’s an existential need for adaptability. PVE In your case, the work speaks about trauma, abuse, and spaces that change without regard to others. The interior space becomes a specter of terror within a space of beauty. AS Going back to your question of ornament: I am using it as a device that facilities certain discussions. Analia Segal, Taormino, installation detail. Courtesy of the artist. KMQ A wall for you seems to be what the page is for me and that your intervention on that wall is like a language applied to it – a physical language – its own kind of semiotics as Patricia says. JD It’s also very subversive. When you have the blank page but instead of using the white page or surface, you are questioning the validity of that surface. We are used to seeing an image applied to the surface but that’s just a convention. Art in the last half century – what the conceptual artists have done – is to counteract those conventions. PVE I like your use of the word subversive – I’ve used the idea of camouflage where my wall interventions take on the same “skin tone” as the exterior. In my piece – camuflaje @ 12°9’19″N 86°16’19″W – the title means camouflage and points to the coordinates of the National Palace of Culture in Managua, Nicaragua, which was the center of government in the 1970s when Pastora kidnaped the congress and demanded the release of political prisoners. Patricia Villalobos Echeverría, camuflaje @ 12°9’19″N 86°16’19″W ,installation view at The National Palace of Culture / El Palacio Nacional de la Cultura, Managua, Nicaragua, 2009. Courtesy of the artist. JD That’s interesting! For me, the greatest art is the piece that no one knows is art [laughter]. 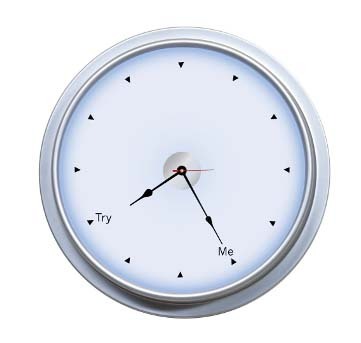 How to reach that point? What Duchamp did was the other extreme: he took something from the real world and put it in the gallery. It’s like a hornero – comfortable, confined. To take a Campbell’s soup can from the supermarket and put it in an art context is interesting but to take a Malevich and put it in a Walmart would be something! KMQ Like On Kawara’s Pure Consciousness project, in which he placed a number of his date paintings in kindergarten classrooms. He hung them very high and asked the teachers not to introduce them to the students or even answer questions about them. They were simply meant to integrate into the space, accepted as the norm. JD Yes, that’s an interesting artistic activity. JD … to incorporate certain familiar elements so that a sterile space becomes active. KMQ There does seem to be both an incentive to conjure a stronger awareness of space but at the same time it’s as if these walls bear memory and you, as artists, discover this in the process. AS That’s why I started thinking of the art space as a theatre. The objects within the space establish a dialogue with the viewer and we – both artists and viewers – are all acting upon this stage. I moved eight times in ten years when I first came to New York and not only was I shocked by not having enough space to work but I was also impressed by the traces of the previous inhabitants – the hole in the wall, the mark on the chair – these are memories of events that speak of the people who previously lived in the space. 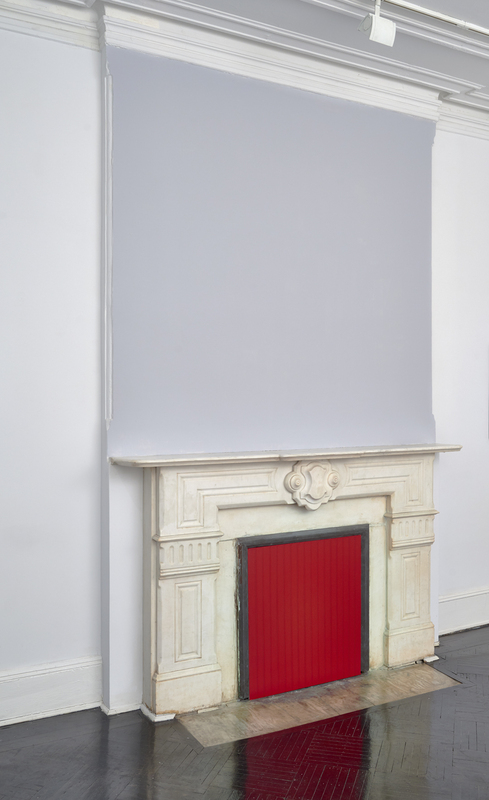 Jaime Davidovich, Fireplace tape project, 1974-2015, installation view Henrique Faria Fine Arts. Courtesy the artist and Henrique Faria, New York. PVE …and you added your voice to it. KMQ Jaime, in relation to the notion of human presence, I’d like to address the covert sensuality in your work. Your tape pieces seem to either draw in or expand out depending on the perimeters you set. For example, when you tape a delimited space like a fireplace or a billboard, you are working within existing frames but when you take over a wall, which seems more expansive, the surface becomes more like skin and the haptic quality is extremely intense. You talk about your work as being recreations of early work from the 1970s but to me these works are now, from 2015. KMQ So you accept this? JD Yes. When I did the fireplace piece, I came into the room and saw it as a foreign object so I thought about how I could integrate it into my work. When I do a wall…think about the process of placing the tape on the wall, I call it “walking the tape” – this is similar to my feeling of videotape – you have this element of time that can go on forever. Bertolt Brecht said that the role of the artist is to look through a peephole at the world. 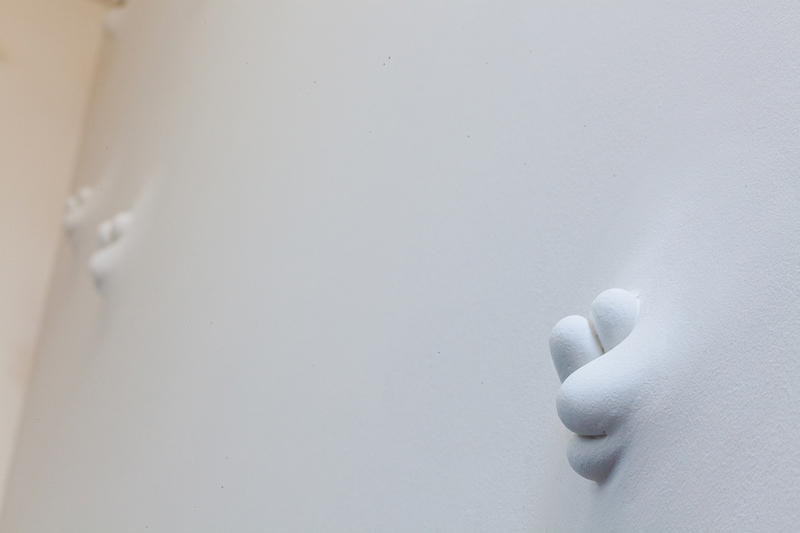 This is the way the artist reaches the world – through these little holes. This is the concept for me: to go to wasted places, places that are forgotten, or places that have residue. This is the role of the artist: to look at the places where you’re not supposed to look and do the things you’re not supposed to do. 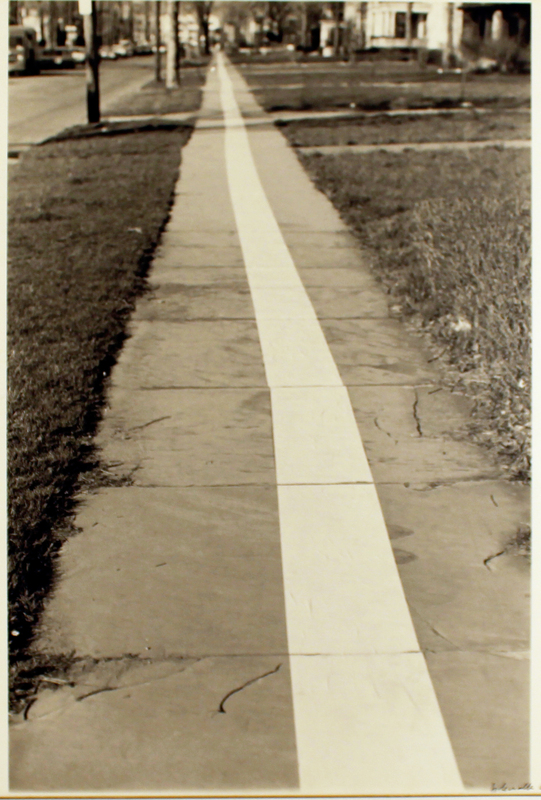 Jaime Davidovich, Tape project, 1972/2015, installation detail, the Bronx Museum of the Arts. Photo © Kathleen MacQueen. Applying the tape is a very physical relationship with the wall. The tape is in my hands and applying it to the wall is a very direct, tactile contact with the material. It’s closer than when you work with paint because the brush mediates the contact. With tape you caress it, you smooth the tape – it’s very sensual. AS How many hours do Patricia and I take to sand the protrusions on our walls? PVE Just verbalizing the process: there’s an adherence, tape joins, it attaches, when you remove the tape, the sound rips as if it were violent. Tape can reference bandages. It’s not a high art material but has the materiality of detritus. AS That’s why I used tape in my most recent installation Implosion. It was the possibility of a decorative pattern on the wall and at the same time putting things together, affixing, and healing. 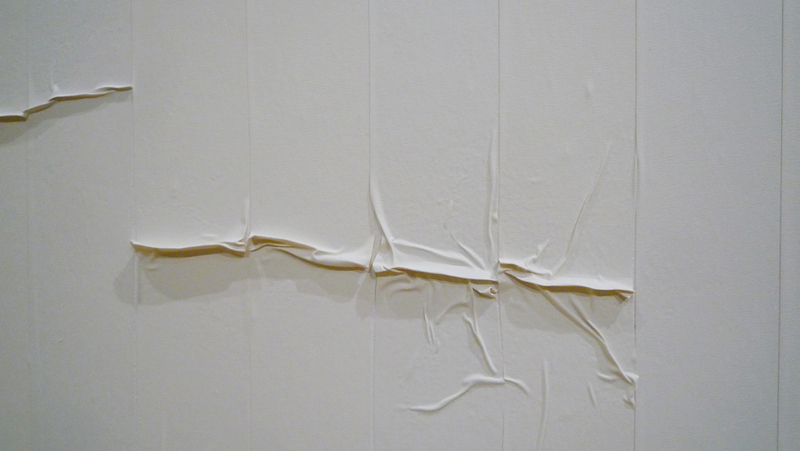 KMQ There’s also this huge tension since tape never wants to behave – it wrinkles, it crimps up, it leaves residue. AS I have a question for Jaime. Since I’m interested in psychoanalysis and Freud, I was wondering how important is the reflective surface of the tape, which offers the idea of a mirror? Also, when you cover the television…for example, when someone dies in an Orthodox Jewish family they cover up the mirrors so that you don’t see yourself in sorrow. Does this resonate? JD Sure, the covering is like a shield. What do you do when you’re in a foreign environment: you find a way to protect yourself. My work plays into this concept. KMQ What about the metaphoric content for each of you? Patricia Villalobos Echeverría, parasite (40°27’25”N 80°00’48”W), 2009, installation view, the Mattress Factory, Pittsburgh, PA. Courtesy the artist. KMQ What the viewer remembers? AS It’s why I tend to work in pieces because of being incomplete. When you [looking at Patricia] talk about the responsibility of growing or repeating itself, this is what happens when someone else is looking at the work; they metaphorically take a piece with them, reproducing it in their thoughts. I challenge perception in my installations. For example, in Implosion, there was only one wall out of four that had a complete pattern from the tape but your eye will end up completing the others. In the photo installation, it looked as if the pieces would all fit together but, in actuality, it couldn’t be completed. So in the sense of asking the viewer to perceptually piece together the work, I would consider that an act of metaphor. AS In my video work, INLAND, I use both English and Spanish without translation and I connect words by sound and not by meaning – language as music – meaning is not fixed but renegotiates within language. JD I like the idea of the “unfinished” artwork. It leaves more room for participation. But to do an unfinished work is much more difficult than to do a finished work because it doesn’t rely on technique. So long as the technique is good, the finished work is good; while the line between good and bad is very thin for the unfinished work. KMQ How do you know when to stop? AS The unfinished work shifts the authority from the artist to the work. PVE These are issues of control…a power struggle. AS The role of the artist is in constant flux. I don’t even believe in the possibility of a work being finished. PVE Does this become a discursive space to return to the dialogue? KMQ Or letting go of the idea to accept the strength, power, and significance of the material realm to do its own work? KMQ As Jaime said, you make the work and then step back and see things that were not part of the original intention but are certainly integral to the work. This is also how you, Analia, and you, Patricia, describe the process of give-and-take in the making of the work. KMQ If you simply take the word “surface” which was our starting point today, one of the first associations is “flat.” Yet nothing of what we discussed has anything to do with flatness. Analia Segal, Gretel, installation detail. Courtesy of the artist. AS …the assumption of stability! AS Going back to Jaime’s peephole and thinking then of the skin as we negotiate surface – what is inside the body and what is outside – it’s porous. It isn’t mute. KMQ Also the negotiation between narrow and expansive vision. PVE If the artwork is successful, there’s a porous exchange between it and the viewer. KMQ …the afterlife of the work – its sensual impression. AS I think of it as a life…in constant change between the studio, the gallery, and a world beyond both. KMQ …a good place to leave the conversation unfinished. Thank you. 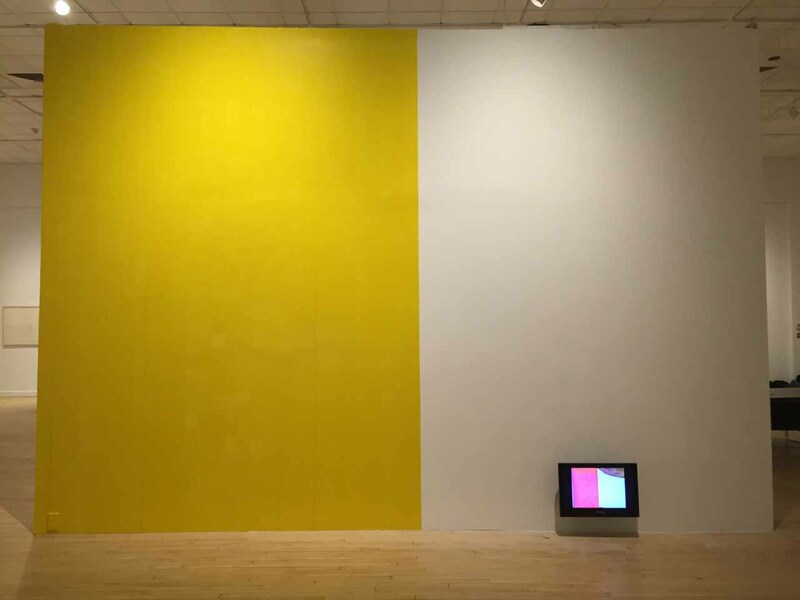 Jaime Davidovich recently presented Tapes Period 1969-1975 at Henrique Faria Fine Art; his retrospective at the Bronx Museum of the Arts closes after June 14th. Analia Segal’s 2015 exhibition at Opus Projects Gallery in Chelsea was entitled Implosion. 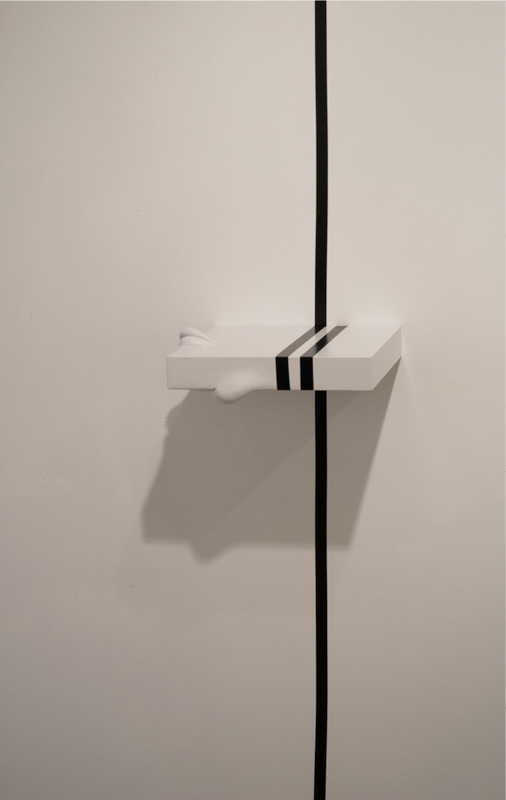 In 2014 she exhibited at Point of Contact Gallery in Syracuse University. 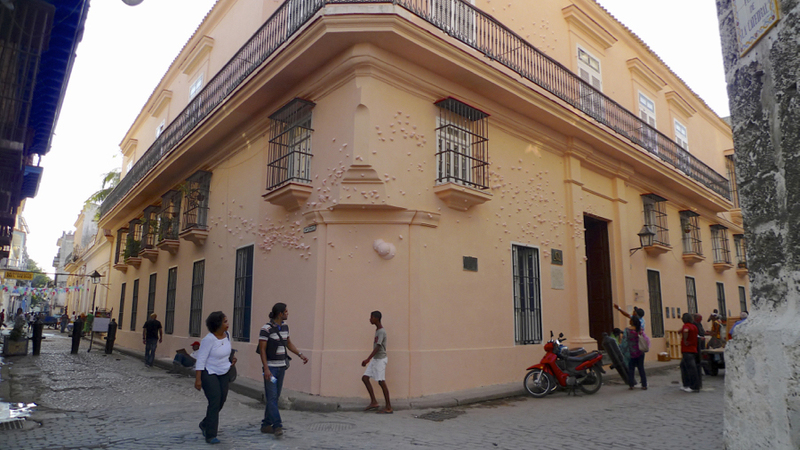 Recent exhibitions for Patricia Villalobos Echeverría include: Adaptación, at POINT, San Salvador, El Salvador in 2015, Trans_Porta Sivar, a participatory project as part of a series of 2014 urban interventions in San Salvador, El Salvador, and the 11th Bienal de la Habana, Centro de Arte Contemporáneo Wilfredo Lam, Havana, Cuba, 2012. The Mexican muralists: Rufino Tamayo, David Alfaro Siqueiros, and Diego Rivera. Edén Pastora, a.k.a. Comandante Cero, kidnapped the Nicaraguan congress in August 1978. The lead photo on the site’s front page depicts: sobremar, 2005, by artist Patricia Villalobos Echeverría, a single-channel video projection onto EPS foam, installation view at the V Biennial of Visual Arts of Nicaragua, Teatro Rubén Darío, Managua, Nicaragua.